This graphic, last updated in March 2019, is aimed to stay at the top of the blog. It will be updated as announced configurations change and buildings launch. The information in the text has been updated through April 3, 2019, though considerable uncertainty remains: note buildings with question marks. As reported in my City Limits article, developers plan four towers on terra firm in 2019 and 2020--B15, B4, then B12 and B13--but that won't get them far enough to building all the affordable units. So what's coming next--promised in one document, but not confirmed--are three large towers over the railyard, B5, B6, and B7, starting perhaps in 2021 and 2022. Note the unbuilt B1 tower over the arena plaza (once dubbed "Miss Brooklyn") and the proposed--but not yet approved--shift in bulk to the unbuilt Site 5, at the far west end of the site. As of now, only one 50% market/50% affordable tower has been built. Click on graphic to enlarge. Design by Ben Keel. The project is already well behind that tentative timetable and, as of August 2018, there is evidence the full project will take until 2035, not 2025 as previously suggested in a now-stale timeline. That further undermines one of the purported rationales for the project: the removal of the "blight" of an open railyard, which requires a deck for development. Also see my essay on the Culture of Cheating and the missing promised jobs. And my history of original developer Forest City Ratner, now Forest City New York. And an account of the project since the 2011 Battle for Brooklyn documentary. This is cropped from a Greenland USA press release. It omits the planned/proposed tower at Site 5, at the far west of the image. The below graphic is more of a concept plan than a confirmed representation, from the new firm L&L MAG (which had as of 2018 a service contract with minority shareholder Forest City New York to speak for the Greenland Forest City Partners joint venture), but it does show the bulk from a different angle. The pink arrows point to completed buildings, the green to the two tallest (Site 5 and B4). Note that the huge two-tower Site 5 project has been floated but has not been officially proposed, much less approved. 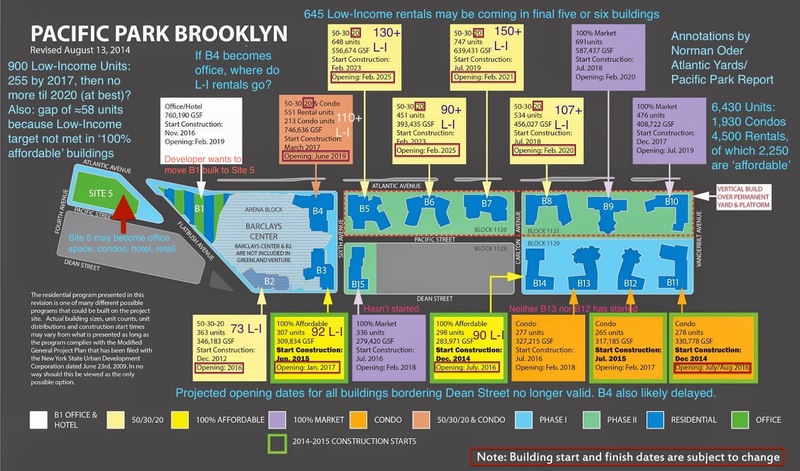 This is from CityRealty, and not only omits Site 5, it curiously downplays--with little illumination--both the Barclays Center and 461 Dean, both built by Forest City. It's 22 acres, with public property--the Metropolitan Transportation Authority's Vanderbilt Yard--representing 8.5 acres and public streets at least 3 acres. Originally 16 towers were planned; now there would likely be 15, with four completed as of now. There should ultimately be 8 acres of open space. 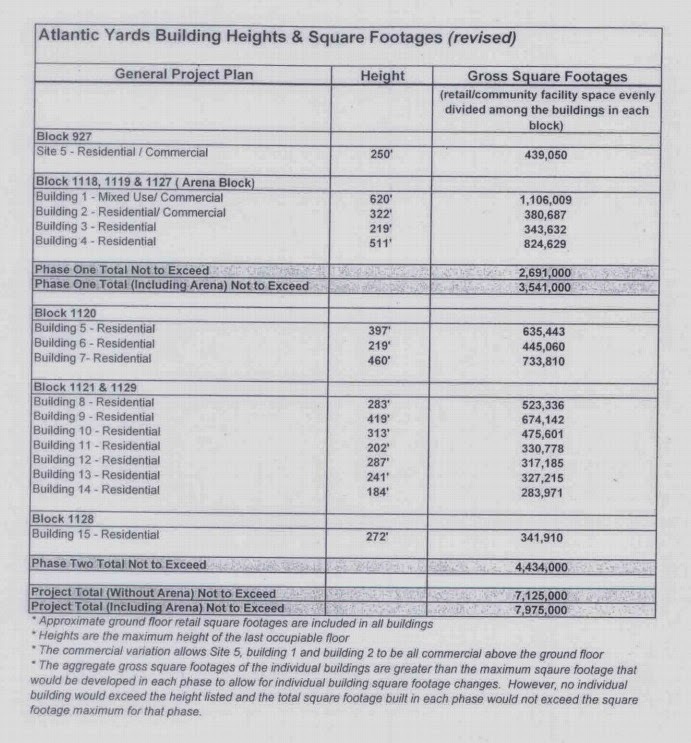 Atlantic Yards was announced in 2003. 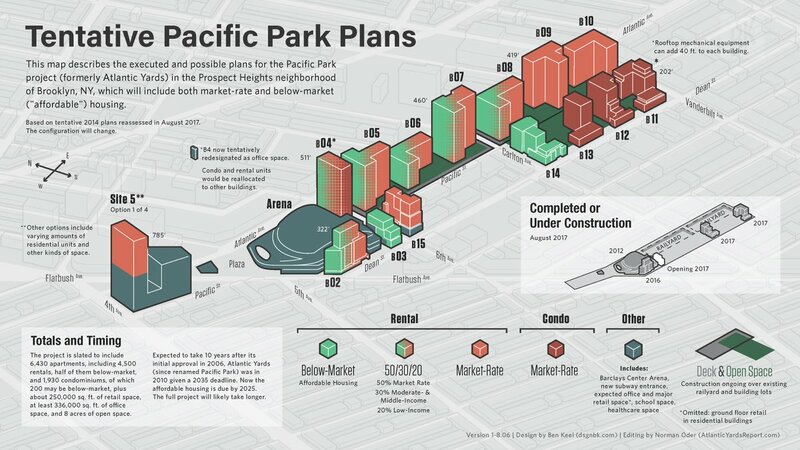 Why was the name changed to Pacific Park in 2014? That was when Greenland USA, an arm of Greenland Holding Co. (Shanghai government-owned, in significant part) bought 70% of the project going forward, excluding the modular tower, B3 (461 Dean) and the arena operating company. I argued that it was an effort to distance the project from the taint associated with "Atlantic Yards." So who owns the project? The original developer was Forest City Ratner (later Forest City New York), an arm of Forest City Enterprises (later Forest City Realty Trust). Forest City was bought in late 2018 by Brookfield Asset Management. The arena is nominally owned by New York State. Forest City in 2010 sold 45% of the arena operating company to Mikhail Prokhorov's Brooklyn Sports & Entertainment and in 2016 sold the rest to Prokhorov. (Prokhorov had bought 80% of the Nets in the first transaction, and the remaining portion in the second.) The one tower owned solely by Forest City, 461 Dean, was sold in 2018 to Principal Global Investors. Forest City retained a 30% share of the three towers built before 2018 by the joint venture Greenland Forest City Partners: 535 Carlton, 38 Sixth, and 550 Vanderbilt. The joint venture, with Greenland owning 95%, was to build the remaining towers, though Greenland has since sold the rights to build on three development sites: B15 to The Brodsky Organization and B12 and B13 to TF Cornerstone. What was the project's timeline, and how has it changed? Here's a project timeline as of November 2018. Here's a visual history, up through 2010. When Atlantic Yards was announced in December 2003 (here's the vastly overoptimistic original promotional material), it was supposed to take ten years to build. That same timeline persisted after the project received official state approvals in 2006. After delays, including lawsuits and the recession, project terms were changed in 2009. A 2035 "outside date" was assigned for the project, with penalties only for a few buildings and the platform. Representatives of the developer and the state, as of October 2018, refuse to offer a timeline. The first tower was supposed to break ground in late 2010, but Forest City moved the goalposts at least eight times. It finally broke ground in December 2012, but took nearly four years to build. The project was originally supposed to have 4,500 rental apartments in 11 towers, plus four office towers with 10,000 jobs. Later, one tower was added and much of the office space was swapped for condominiums, 1,930 in all, and space for far fewer jobs. In 2014, the state and community negotiators, who had threatened a lawsuit regarding delayed affordable housing, agreed to a May 2025 deadline for the affordable housing, and to build two "100% affordable" towers. While many assumed that represented the likely finish date for the entire project, that now seems very unlikely unlikely. Greenland has said it will meet the affordability deadline, which implies front-loading affordable units, perhaps, as noted above, with another "100% affordable" tower. (One question--see below--is how affordable they will be.) A former Forest City executive in January 2018 offhandedly estimated that the project would take another decade. I'd bet it goes past 2028, given the 2035 "outside date." The affordable housing was originally supposed to appear in buildings that were uniformly half market-rate units, half below-market ones: "50/50," or, more precisely, 50/30/20, with 20% low-income units, and 30% moderate- and middle-income ones. However, the 2014 changes reframed the configuration of affordability, with a severe skewing to middle-income units. Instead of devoting 20% of the units in the two "100% affordable" towers to units in Band 5, the most expensive cohort, the buildings have 50% Band 5 units and the overall configuration is severely skewed. Four of 15 (or 16) towers were completed (or nearly so) when, in 2016, Forest City Realty Trust, at that point the junior partner in the joint venture with Greenland USA (see below) announced it would pause new construction. In early 2018, after Greenland agreed to buy most of Forest City's remaining share, the developer said it aimed to start a new building, B4, in 2019. In October 2018, after Greenland said it had sold rights to three development sites, it projected that B15 would start in 2019, while B12 and B13 would start in 2019 or 2020. We learned in February 2019 that B12 and B13 would start in 2020. All would be rentals, rather than containing condos in part or in full. Wasn't the whole project--rather than just one tower--supposed to be built via innovative modular technology? Yes. But it didn't work. What's the next building to be built? Work on B15, across Sixth Avenue from the southern half of the Barclays Center, launched in March 2019. B4, on the northeast corner of the arena block, is expected to launch until the second quarter of 2019. What about shortly after that? The sites are cleared for B12 and B13 on the southeast block, and they're expected to start in 2020. They previously were expected to start much sooner. B12 was unveiled in September 2015 as 615 Dean Street and B15 was unveiled in December 2015 as 664 Pacific Street. B15 was delayed by a dispute with neighbors and perhaps for business reasons. It will contain the planned middle school, which, had it been built, would be open by now. Now the school is supposed to open in 2022. The original architect for B15 should remain. How tall will the buildings be, and what will the square feet be? See chart at right. Click to enlarge. How many affordable units have been built? Exactly 782 (of 1,242 total apartments constructed), including 254 (32%) highly-coveted low-income units, for which there was a huge response in the lottery. By the way, the low-income units are supposed to be 40% of the overall total of below-market units, so they're lagging. But 336 of them (43%) have been Band 5 upper-middle-income units--for households earning near or above six figures--approaching market rate, so it's been hard to find tenants. Some renters at 535 Carlton have been offered two months free on a one-year lease. (Rent at one market-rate studio actually dipped below an affordable unit within another project building.) It's better to describe "affordable units" as "below-market" "income-linked," since households are supposed to pay 30% of their income in rent. Of the 2,250 pledged affordable rental units, 1,468 apartments remain to be built. However, the next four buildings—all on terra firma, not over the railyard–might deliver enough below-market units to reach a total of 1,334. If so, a gap of 916 units to reach the 2,250 requirement by 2025 would persist. That could be addressed in the next three towers. Of the 2,250 expected market-rate rentals, 2,068 remain to be built. Of the 1,930 approved condos, 278 are built, and 1,652 remain to be built. 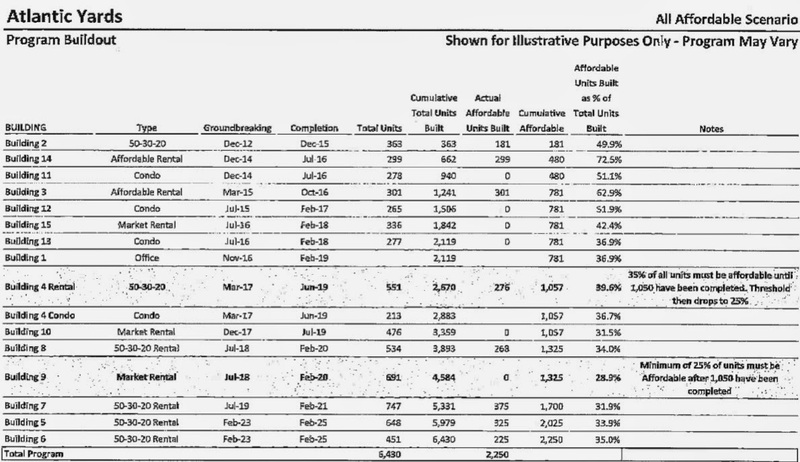 That said, plans announced in 2014 indicated only 1,033 condos, which implied more market-rate rentals. And the loss of a 421-a tax break applied to condos makes future condos less likely among the 6,430 total units. So that's about 19.3% of the total units approved, but 34.8% of the affordable ones. Weren't half the affordable units, in terms of square footage, supposed to be geared toward families? Yes, but Forest City backed off that pledge for two- and three-bedroom units with the first tower. 461 Dean. The next two rental towers, 535 Carlton and 38 Sixth, did have 35% of the apartments (in unit count) for families, though, which is likely close to the square footage goals. 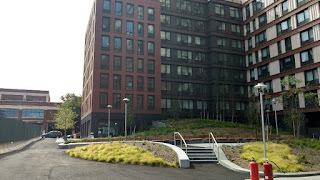 Atlantic Yards/Pacific Park has a projected 6,430 apartments housing 2.1 persons per unit (as per Chapter 4 of the 2006 Final Environmental Impact Statement), which would mean 13,503 new residents, with 1,890 among them in low-income affordable rentals, and 2,835 in moderate- and middle-income affordable rentals. That leaves 8,778 people in market-rate rentals and condos, though let's call it 8,358 after subtracting 420 who may live in 200 promised below-market condos. So that's 5,145 in below-market units, though many of them won't be so cheap. No buildings are expected to begin construction until 2019. There are 1,468 affordable rentals to be built by 2025, which will be allocated among low-, moderate-, and middle-income households. How many jobs have there been? That's tough to figure out, because, while there have been periodic reports of the number of workers at the construction site, or the number of total arena employees, the most important metric is FTE (full-time equivalent) jobs. Consider this analysis, which suggests that the supposed 2,000 arena jobs (since increased) can't add up to 1,135 FTE. Suffice it to say that there's no proof of the supposed 15,000 construction jobs (in job-years), nor any evidence that the number of jobs, on a pro-rata basis, meets that metric. There are few permanent jobs, since only four residential buildings have opened, with no retail. The developer failed to hire the promised Independent Compliance Monitor required by the Community Benefits Agreement. A highly-coveted pathway to union construction careers ended in a bitter lawsuit and murky settlement. 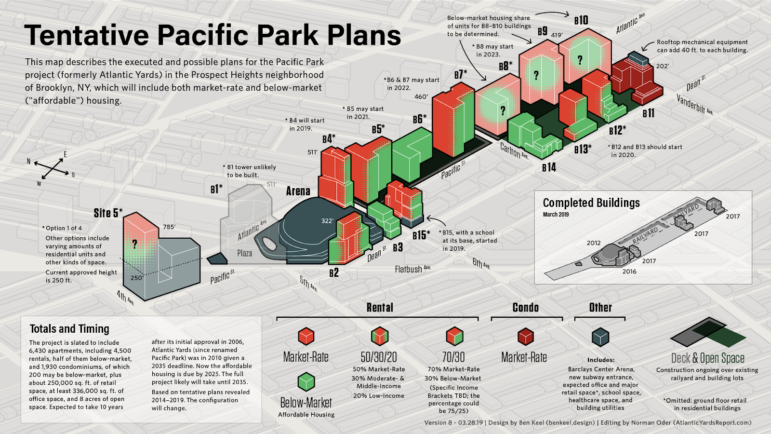 Does the project have an "brand-new 8-acre park," as marketers have trumpeted? No. The "park" won't be finished until the project is done. And it's not a park, but publicly-accessible, privately-managed open space. For now, as of early 2018 photos, it's pretty paltry. Do people still support the project? Sure. There's a huge need in the city for "affordable housing," and the mayor has made an example of this project, with relatively little public dissent or scrutiny. The one active signatory of the Community Benefits Agreement, the Downtown Brooklyn Neighborhood Alliance, distributes 50 free tickets (and, usually, tickets to one suite) to arena events to grateful nonprofit groups. But there's a general cloud over the project, thanks to the various challenges raised by project opponents and critics, as well as journalism, a documentary film, and a musical play. Have some former project supporters or overseers changed their mind? Investor Londell McMillan said "it breaks my heart to have been a party of the project." Fervent public testifier Umar Jordan said "they played Brooklyn." Former state overseer Arana Hankin said "there really is no accountability." Has original developer Forest City Ratner made money on the project, given the benefits of public subsidies, tax breaks, and a zoning override? No, it looks like they have taken significant losses. However, if they'd had the patience--tough with a public company--and skill set to run a basketball team, they might have endured to make a huge profit on the Brooklyn Nets, as Mikhail Prokhorov seems to be doing. What's the total amount of subsidies, direct and indirect? How much money did the developers raise via cheap loans from immigrant investors seeking green cards via the EB program? How much did they save? Did the loans create jobs? As I wrote regarding the third round of fundraising, $228 million and $249 million and $100 million, or $577 million. It's hard to quantify the savings, but Fortune said "Raising $100 million through EB-5 can add $20 million to a project’s bottom line." A leading industry middleman, who worked on the second and third rounds of Atlantic Yards/Pacific Park EB-5 fundraising, admitted that his projects typically don't need the money. That means EB-5 doesn't create jobs, which is the rationale behind the program. How has the area context changed? Until Atlantic Yards was announced, the 512-foot Williamsburgh Savings Bank tower, with a distinctive clock, was the tallest building in Brooklyn. Original architect Frank Gehry's flagship Atlantic Yards tower, Miss Brooklyn, was supposed to be 620 feet. It was lowered to 511 feet in 2011, but would have been three times the bulk. Now it won't be built, as the arena's plaza will persist, but the bulk of Miss Brooklyn is expected to be transferred across Flatbush Avenue to Site 5, and a tower could reach 785 feet. The bank building has been sold: the upper floor offices are now condos, and the bank space became an event space and now will be retail. 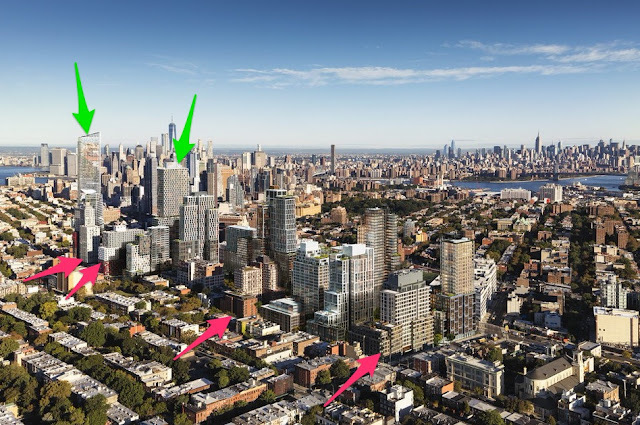 Meanwhile, the Downtown Brooklyn rezoning, and associated development around the Brooklyn Academy of Music, have changed the development spine along Flatbush Avenue, with numerous towers. 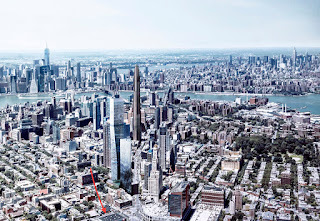 A "supertall" is planned, more than 1000 feet, next to Junior's and a 986-foot tower, 80 Flatbush, was proposed just north of the former bank building, now One Hanson, and was later reduced to 840 feet. So that to some degree normalizes the density/height around the arena block, at least that which solely borders avenues. 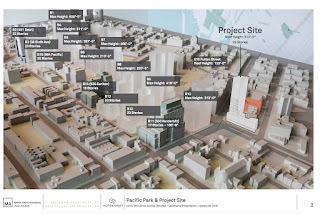 Site 5 would border row houses and low-rise apartments, in part, as do 38 Sixth and 664 Pacific, and the four towers on the southeast block of the site. A proposed 312-foot tower just northeast of the Pacific Park site, 550 Clinton Avenue, shows the changing context, as well as awkward transition of the project to the south. Why did Forest City announce in 2018 that it would sell all but 5% of its remaining share to Greenland? It's cutting its risks, and losses, as the firm, now a real estate investment trust (REIT) is trying to get away from risky development projects and focus more on income-producing projects. We don't know the terms of the deal. Will Greenland make money on the project? Too soon to tell. We don't know the terms of the latest transaction with Forest City. We don't know the affordability levels and subsidies for future towers. We don't know what version of the Site 5 tower(s) will be approved. We don't know future business/real estate cycles. But Greenland also has/had other ambitions, such as making its mark in New York City and developing in an economy less volatile than China. Would the various subsidies, tax breaks, and government assistance have been approved if city and state officials knew they were benefiting a Russian oligarch billionaire and a company significantly owned by Shanghai? What are some common mistakes in Atlantic Yards news coverage over the years? It was not designed to be "over the railyards"
The project site is not in "Downtown Brooklyn"
Why was a green roof installed on the arena? Well, the original plan was for public open space. Then it was for those in the four towers flanking the arena. Then it was eliminated, after the project was redesigned and reconfigured, with four towers no longer built simultaneously with the arena. However, after a flaw in the arena design merely, as claimed, as some sort of public amenity. It's also aimed to tamp down noise escaping from the arena. How much have the developers gotten in direct government aid and tax breaks? It's complicated. No one's been able to do a full study. For the arena alone, the New York City Independent Budget Office in 2009 estimated a benefit to Forest City of $726 million in a combination of direct city and state subsidies, and city, state, and federal tax breaks. Given a smaller amount of tax-exempt bonds sold, I'd adjust that benefit downward by about $50 million. However, city and state agencies backing the project said the IBO was wrong in not calculating the impact of the whole project (which the city agency said was impossible to do). I'd add that the IBO left out the $200 million-plus value of the naming rights, which the state gave away. No one has counted the naming rights as a subsidy, though a state official once said that it was part of the financing for the arena. And no one's yet specified the overall value of housing subsidies. How much direct aid did the city and state promise when the project was announced in December 2003? None. The project, Bruce Ratner said, would be funded out of "incremental revenues." In a February 2005 Memorandum of Understanding, the city and state each promised $100 million. Only after the project was passed in 2006 did the city announced additional subsidies: apparently $105 million, as claimed by Forest City. The city now claims its total subsidies are $179 million or $171.5 million, not $205 million. Maybe. But we do know that Forest City Ratner's seemingly generous payouts for property owners relied on public funding from the city. What happened with the deal for the the MTA's Vanderbilt Yard? Here's the backstory regarding the key public property, 8.5 acres, part of the 22-acre site? Instead of paying $100 million cash, Forest City got the authority--controlled by the mayor and governor--to agree to accept $20 million for the portion needed for the arena. The developer could pay the $80 million equivalent for the rest of the railyard over 21 years, at a gentle 6.5% interest rate. That's a savings of tens of millions in interest. Beyond that, the agency agreed to accept a smaller replacement railyard. The developer got to save about $100 million. However, costs have risen significantly. The original architect was Frank Gehry, who was supposed to design the entire project. However, his two-sport arena, big enough to accommodate basketball and hockey, was swapped for a cheaper, smaller arena focused on basketball, designed by Ellerbe Becket/AECOM. SHoP was brought in to add the snazzy facade (and oculus), and to redesign the interiors, but the building's program didn't change. SHoP has designed the arena plaza and three towers flanking the arena, the 461 Dean and 38 Sixth, and was initially supposed to design the unbuilt B4, which will now be the work of Perkins Eastman. CookFox has designed 535 Carlton and 550 Vanderbilt. KPF was announced as the designer of the yet-to-be-built B12 (aka 615 Dean) and Marvel Architects was announced as the designer of the yet-to-be-built B15 (aka 664 Pacific), the building with the school. Marvel will stay on, but it's less likely that KPF will. Laurie Olin was the original landscape architect. The current landscape architect is Thomas Balsley. How many arena suites are there? Well, the original arena was to have 170 suites, then 130, but now the number is closer to 90. How much were arena naming rights worth? Not $400 million, as initially reported, but closer to $200 million. 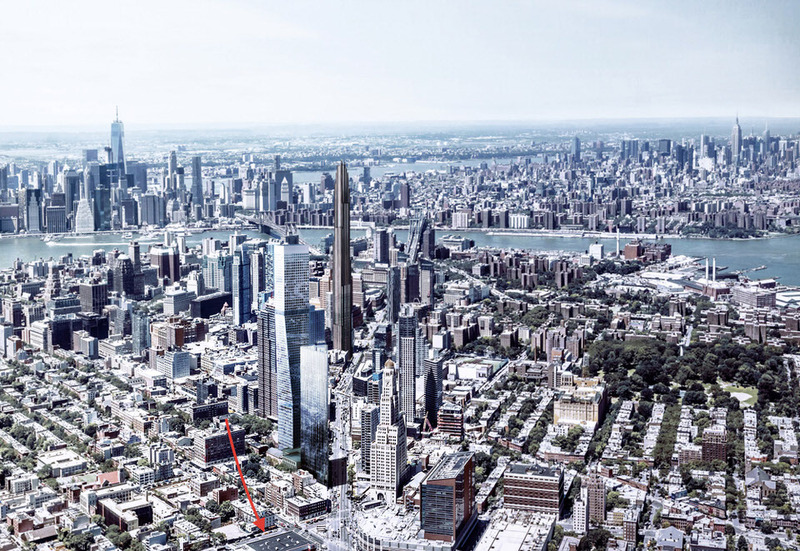 Was the Atlantic Yards site truly blighted, a prerequisite for eminent domain? I found that very very very dubious. Great/helpful update (as always). What's the status of the school? See updates in FAQ for additional info.